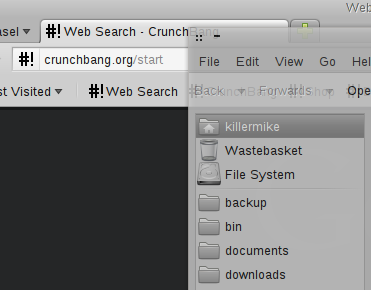 Although officially a version 10 refresh and still under the “Statler” moniker, the latest Crunchbang release constitutes some notable changes. I first covered CrunchBang back in March. In brief, it's a lightweight desktop OS that uses Debian Stable 6.0 as its base. The biggest change in the latest refresh is that the developer has jettisoned the Xfce version in order to become a pure Openbox distro. I'm a fan of Xfce, but I welcome the decision of developer Philip Newborough aka corenominal. 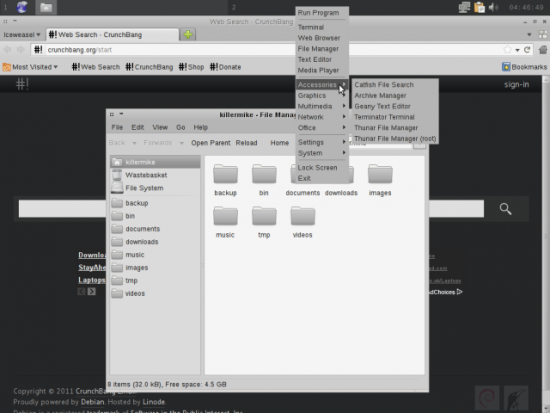 The truth is that there are other Xfce based distros to choose from such as my personal current favorite, Xubuntu. One of the biggest challenges for a smaller Linux distro is to carve a useful niche for itself, and if this helps him to hone the Openbox experience, all the better. As before, when you first run a new installation of CrunchBang you are prompted to answer a series of questions about additional components such as the development tools and LibreOffice. By default, as ever, the theme is a dark one, but you can easily change this if it's not to your taste. I'm not going get into a drawn-out argument in the comments (see last time), but the window decorations have been changed, and I for one prefer the new design. Overall, the user interface feels fast and minimalist without feeling compromised. However, it isn't a clone of, say, Gnome, and I would advise anyone to have a play around with the Live CD before committing to an installation. It's simple to enable compositing courtesy of either Xcompmgr or Cairo Composite Manager for fancy screen effects. • SLiM rather than GDM as the login manager. • Gigolo and Thunar are set up and ready to go and this means that network resources are can be easily browsed from the GUI. In the announcement, we are informed that users already running Statler would be best advised to either stick with the version they have or to carry out a fresh install with the refreshed version due to differences under the hood. Being critical for a moment, I wish that the release naming scheme was a bit clearer, as the number of changes merit a point release. In conclusion, it looks like Crunchbang won't fit all tastes but continues to offer enough uniqueness to merit consideration.